Peak oil refers to the maximum extraction rate of oil, after which the rate of production declines. It is widely believed that we are now approaching World Oil Peak. Some say we have even passed it. Around half of all global oil has been extracted. In little more than a hundred years we have used about 1 trillion barrels of the 2 trillion barrels formed over 90 million years ago. All the readily available, easy to extract stuff has been used up, so oil companies are resorting to ever-more inaccessible environments such as the Arctic, Antarctic, Amazon and deep seas to find more oil. Drilling in these locations presents huge technical problems and the energy needed to extract oil is rising all the time. This means the energy return from oil is rapidly declining while its price is rapidly rising. We are now running out of the cheap oil that underlies our entire lifestyle. Even the most basic commodities like food depend on oil. The average food item has travelled between 1,000 and 1,500 miles before it arrives on our plates. For every 1 calorie of energy in the food on your plate, it has taken 10 calories of fossil fuel energy to get it there - burned in farm machinery, fertiliser, pesticides packaging and transport. Demand continues to escalate while oil production shows clear signs of slowing down. This widening gap between production and demand is clearly not sustainable. We will become increasingly restricted in our ability to consume petrol and oil-based products which has serious implications to our current way of life. 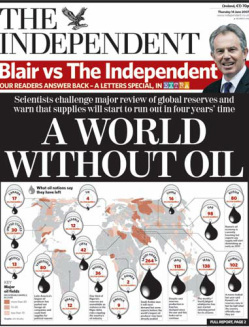 Our economy demands unending growth which, in our current system, is fuelled by abundant, cheap oil. A decline in oil availability triggers economic depression because the economy simply cannot grow without a growth in energy. What about coal? Both China and the US have vast reserves of coal. But if we started using coal as a replacement for oil we would soon find ourselves in a “Peak Coal” situation. The good quality coal (anthracite) is already in short supply so the energy return from coal is also declining rapidly. Coal extraction involves a huge human and environmental cost that also makes it unsustainable - and we wouldn't easily be able to convert the world’s 500 million internal combustion engines to run on coal. The good news Peak Oil prompts us to ask deeper questions about the kind of society we want to live in. There is abundant evidence that simply more growth, more money and more energy will not bring us a higher quality of life or more happiness. Peak Oil is an opportunity to embrace the reality that the Industrial Growth Society is unsustainable and will inevitably come to an end. We have a window of opportunity to implement ideas and structures that do not rely on an endless supply of cheap oil but can provide a high quality of life that is socially just and ecologically sustainable. This is what the Transition Town movement is all about.